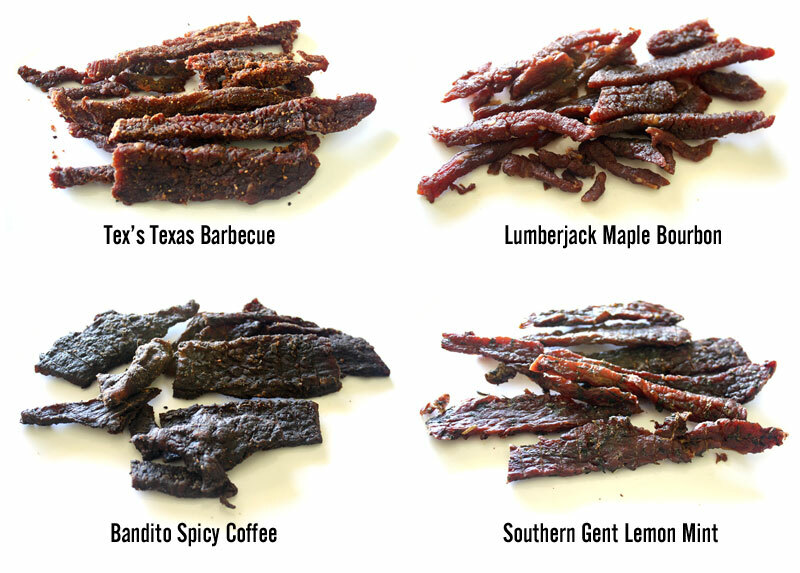 Uncle Andy's Jerky was conceived about a year and a half ago, the vision of Andrew Hanenberg, based out of Cedar Grove, NJ. It started when Andrew was crossfit training and got hooked on the paleo diet. He bought a meat slicer at a hardware store and started experimenting with jerky recipes. Inspired by the bold, eclectic flavors introduced by craft breweries like Dogfish Head and New Belgium, etc., he perfected four original recipes and is now crowdfunding to get his business rolling. At this point, you can't buy Uncle Andy's Jerky. Below are reviews based on pre-production samples sent to us from Andrew. Lightly sweet, with a light black pepper spice, graces the palate over a barbecue sauce-like flavor. It's not a thick, bold barbecue flavor, but more clean and light, providing enough seasonings to give off that smoky, open fire flavor, without weighing you down with over-the-top sweet and stickiness. The flavors that seem to define this jerky most of all is a saucy, tomatoey flavor, a light smoky aroma with some black pepper spice. Seasonings like garlic and paprika seem logical in a BBQ variety. Lastly, a light natural meat flavor finishes off the chew. The meat consistency seems like all meat, seeing little fat and encountering no stringiness or unchewable tissues. It chews like real strips of steak, and is overall easy to chew and eat. I'd pair this with a dark lager, like a Shiner Bock or a Negra Modelo. The jerky already has a lot of flavors going on, and you want just enough darkened malt and cold, easy drinking brew, to wash it down. A little more sweet, this variety is more tame, and tends to bring out the natural meat flavors. The actual flavor of maple is difficult to discern in this, as is the bourbon. But it does have a light aroma of whiskey-marinade. Otherwise, the flavors that define this jerky is largely a moderate sweetness and saltiness, with a fair amount of natural meat flavors. I can pick up faint traces of flavorings, perhaps the bourbon malt and garlic. The meat consistency seems mostly all meat, with only small bits of fat noticeable, but otherwise no stringiness or unchewable tissues. It chews easily, and feels like eating real slices of steak. I'd pair this with an IPA. The sweet and salty flavors of this jerky should combine well with the hoppy bitter and aroma of an IPA. The flavor of coffee beans comes on strong in this variety. But mix in the flavor of chile peppers, and you have something that's sure to wake you up in the morning. There's also a bit of sweetness and saltiness too. 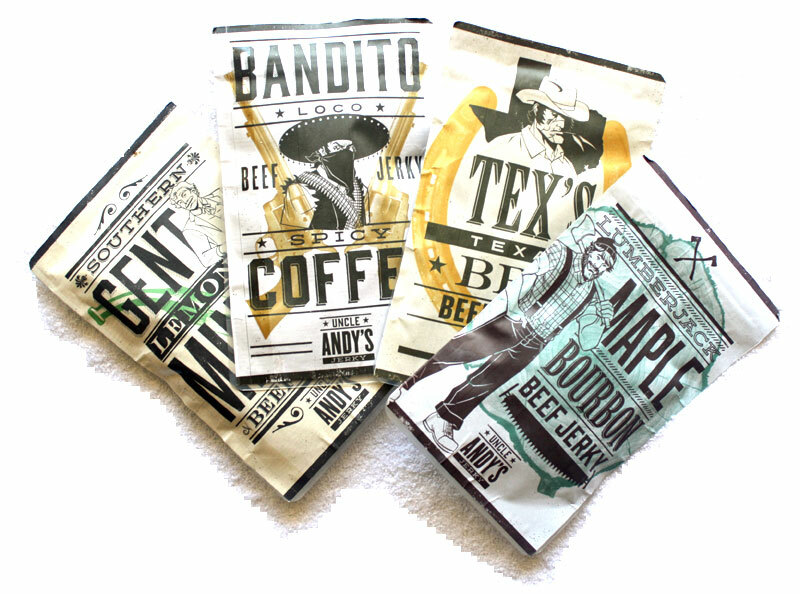 Like the name says, the flavors that define this jerky is the roasted coffee beans with the spicy flavor of chiles, and tempered with a moderate sweetness. The level of heat in this feels at a medium level (level 3 out of 5). 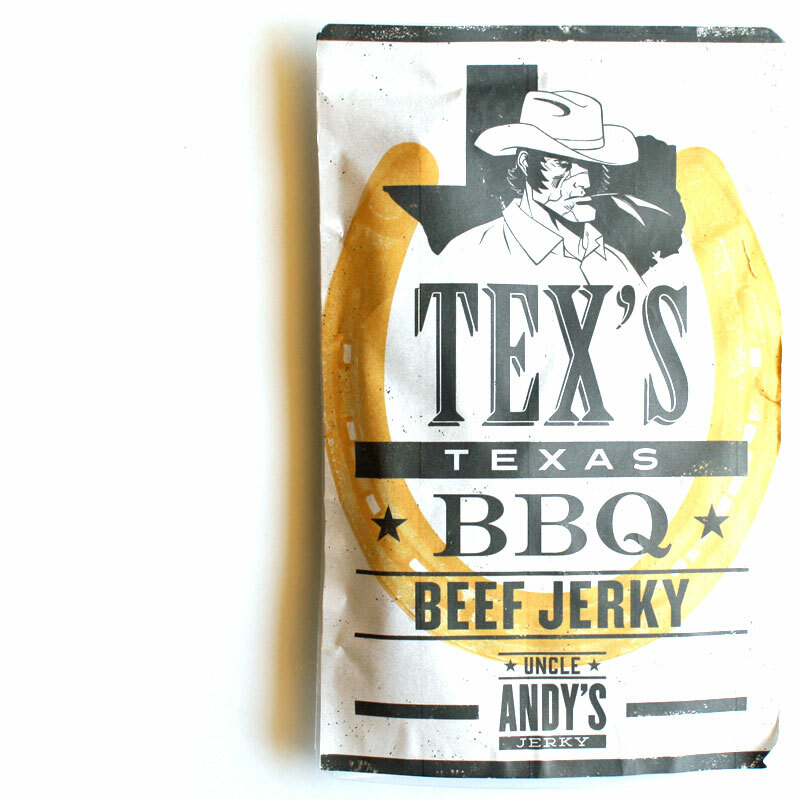 The addition of roasted coffee seems to give this jerky a smoky character. The natural meat flavors are more difficult to identify, perhaps due to the stronger coffee flavor. This actually chews a little more soft and tender than the other varieties. I seem to feel more of the oiliness of the meat. It still tends to chew like real steak, but more tender. I'd pair with a nut brown ale, which will let you appreciate the coffee and smoky flavors of this jerky. A porter or stout, on the other hand, will blend the coffee and smoky flavors together and make it more difficult to appreciate the jerky. It starts out with a light lemony flavor, but soon brings in the mint. Over the next few chews, the mint builds up, but is soon met with a strong saltiness. But while all that is going on, the natural meat flavors is making a showing. This jerky reminds me of the mint tobacco I recall smelling as a kid at the bar my mom worked at. 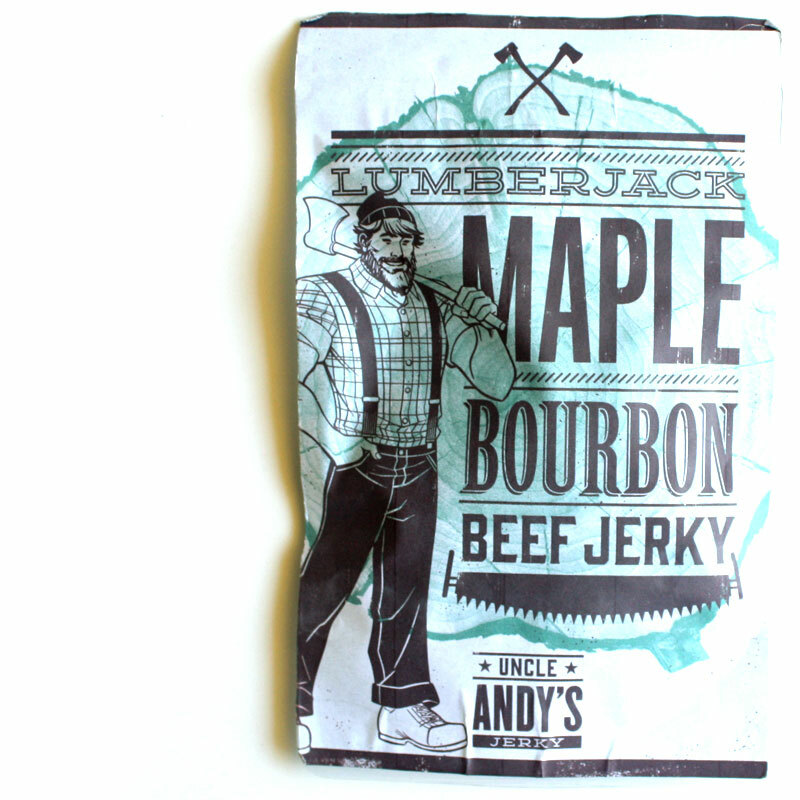 What largely defines this jerky is the stronger saltiness and natural meat flavors. The lemon flavor is well-noticeable, as is the mint, though the former is a touch more dominant. After several chews of this jerky, it really grows on me, and I tend to want more of it. The meat consistency is more dry than the other varieties, a little more chewy, but still very meaty. It feels like real pieces of steak once it's chewed down. It tends to have a more old fashioned style flavor, like the jerky out of the jar, but touched with lemon and mint. A good beer pairing would be a lighter ale, perhaps a blonde, mostly to quench the stronger saltiness in this, while allowing you to pick up the lemon and mint flavors. Verdict: I liked the Southern Gent Lemon Mint the best, finding it quite new and different. 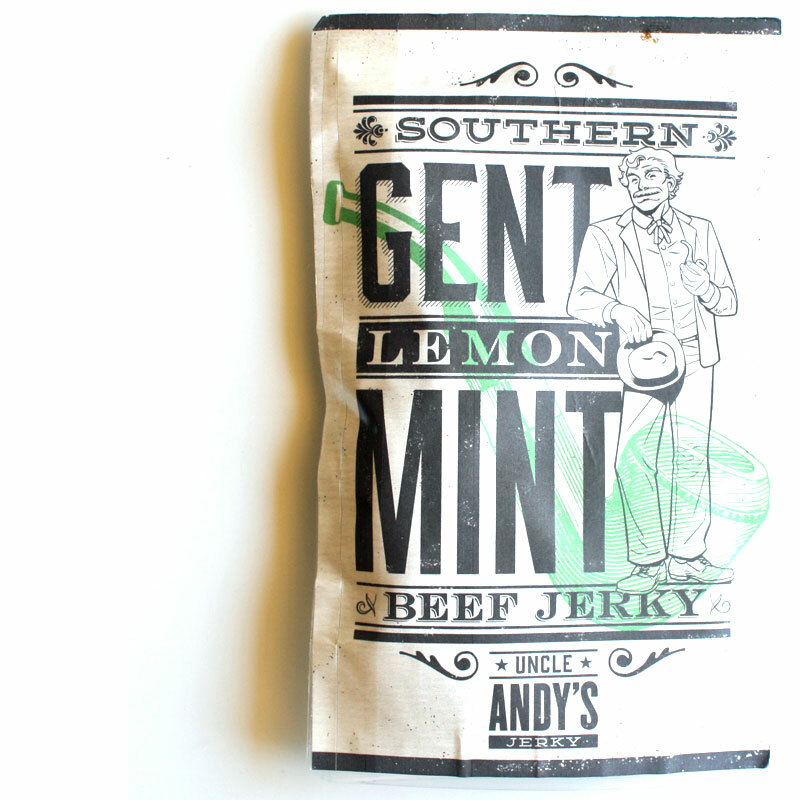 It has the old fashioned jerky style, but throws in the lemon and mint to add a new twist on an old favorite. 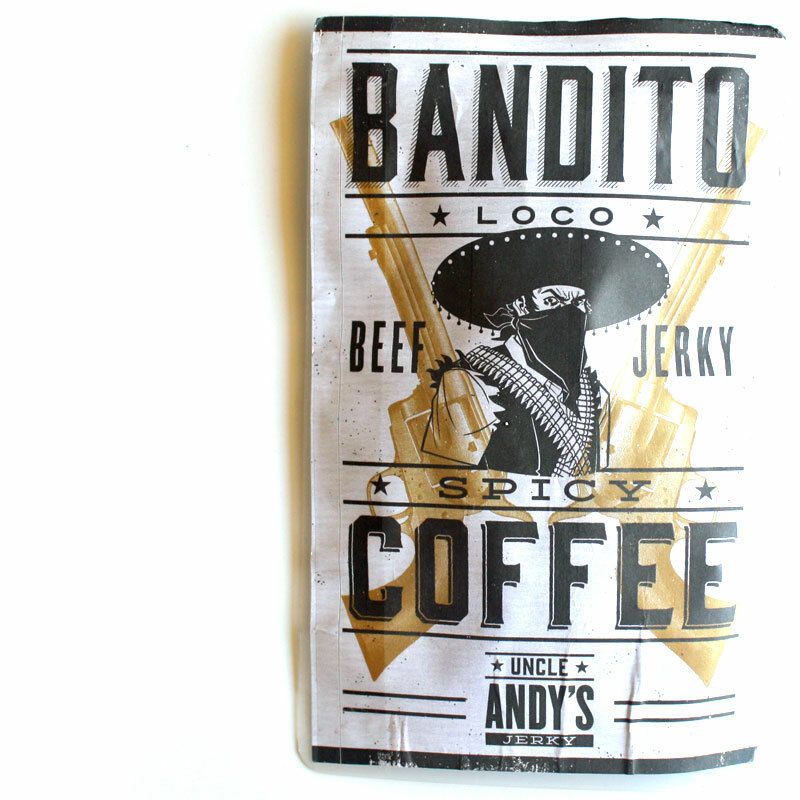 I thought the Bandito Spicy Coffee was also quite original and good. Tex's Texas BBQ was good also, but I didn't see it as new and different. The Lumberjack Maple Bourbon, however, didn't do much for me. Overall, I like Andrew's creativity with Uncle Andy's Jerky. The meat consistency and chewing texture is excellent, and the flavor ideas are exciting and new. I hope he's able to bring it to the masses! Rating: Since these are not production samples, I'm withholding official ratings.